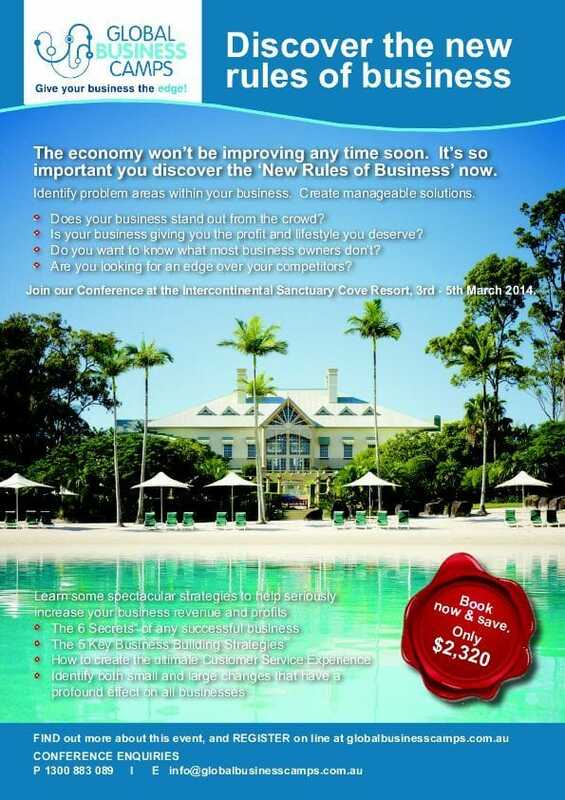 Global Business Camp 2014 - Give your business the edge! Discover the New Rules of Business! The ABS has stated that “on average 44 small businesses are closing their doors each day”. The economy will not be improving any time soon. Working ON your business is one of the most important and most rewarding things you can do. When times are tough it is even more important. Businesses that think and plan for the future actually perform better and look after their customers, clients and patients better than the ones that do not. There’s also the opportunity to have some fun, meet with and talk to some likeminded business people PLUS it is a great opportunity to sit with your accountant for three days just to work on your business. Anyone in business that is serious about improving their profits, cash flow and ultimately their lifestyle should attend this event. The program is valuable to business owners, managers and high level team members. This is your chance to critically look at all aspects of your business, determine the strengths and weaknesses and build a solid foundation. Do you know what is missing in your business? How can we make our business work better than our competitors? How can I make my team more productive? How can I offer better service than anyone else? How can I keep track of everything without burning out? How can I improve my profits, my lifestyle and realise the value of my business as an asset? The program centres around the innovative delivery of the 6 Secrets TM of Business and 5 Key Business Building Strategies TM. We guarantee that when you have completed our program you will not only have the tools to re-engineer your business but you will also have learnt from the business/life experiences of our presenters, fellow attendees and leading business people. The Global Business Camp will change the way you think and go about your day to day business. If you are serious about the future of your business, this is a must attend event. You can visit the Global Business Camp website here, but only Macmillans Waller Fry can offer the Premium Client Rate of $1,980 per person. Added Bonus for Macmillans Waller Fry clients only: FREE 1 hour Action Plan meeting when you return from the Camp, to assist with analysing your business using the concepts covered in the seminar and to assist with the implementation of your new plans over the coming year. Intercontinental Sanctuary Cove Resort on the Gold Coast. When you call to book your room please quote 'Global Business Camp' for your preferred rate of $229 including breakfast for one or $249 for breakfast for two. 100% MONEY BACK GUARANTEE - If at the end of the three days you have received no value from attending the buisness camp, your investment will be refunded in full by the camp organisers. Enter in your email address below and the number of attendees and you will be taken to the registration page to enter your details.